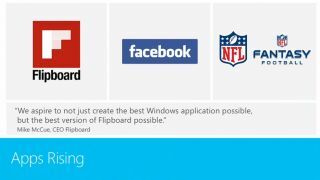 Official Facebook and Flipboard apps are coming to Windows 8 via the Windows Store, Microsoft announced at its Build 2013 conference today. Although neither Facebook nor Flipboard representatives took to the stage, Microsoft CEO Steve Ballmer spoke up for the newest Windows 8 app-developing companies. "Facebook will bring an application to the Windows 8 environment. They're very focused on mobile," said Ballmer, before giving a quote-of-support from the social network. "Mike Shavers, director of engineering at Facebook, said 'Facebook has always believed in connecting everyone on every device.'" "Given our strong and long-standing partnership with Microsoft, this is an exciting way to advance that vision." The internet's other FB, Flipboard, is also releasing a Windows 8 app in the Windows Store. But not just any Flipboard app - the best Flipboard app ever. "Mike McCue, the CEO of Flipboard said 'We aspire to not only create the best Windows 8 Flipboard possible, but the best version of Flipboard possible,'" channeled the Microsoft head. Ballmer also announced that Microsoft recently struck a deal with the NFL to bring its content and apps to all Windows tablets, PCs and phones. Today, the NFL announced that its fantasy applications will be ported to these Windows 8 devices. Ballmer estimates that these new applications will help put the Windows Store over the 100,000 applications mark. The good news for Windows 8 users downloading a wide range of the apps is that Microsoft will be enabled auto-updates for apps downloaded in the Windows Store. We've got a host of new info pertaining to the Windows Store. Why not check it out?